http://nottingham.indymedia.org.uk/articles/910 following several other demonstrations starting last year. Northern Ireland, Scotland and Wales have their own EMA schemes which are still open but these are also under review (see Scotland example). 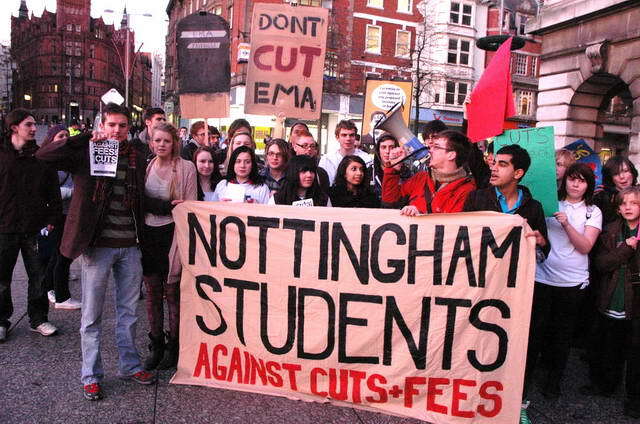 More info, and forthcoming events: Nottingham Students Against Fees and Cuts (NSAFC). School, college and university students are continuing to oppose cuts and rises in fees. This entry was posted in What cuts and tagged cuts, demonstration, education, video. Bookmark the permalink.